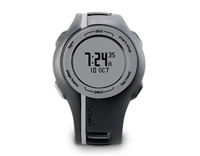 Garmin Forerunner 110 (010-00863-01) €163.00 - buy online at mysatnav.ie - Ireland's leading GPS & Sat Nav store. Forerunner 110HR Pink - Grey with pink stripe, includes a heart rate monitor, otherwise same specification. Forerunner 110 HR Red - Black with red stripe, includes a heart rate monitor, otherwise same specification.